A version of this post was originally published in Portuguese on TheCityFix Brasil by Maria Fernanda Cavalcanti on March 2, 2012. The architectural firm StudioInvisible is drawing inspiration from the hanging gardens of Babylon to reimagine Beirut as a giant green park when viewed from a bird’s eye view. 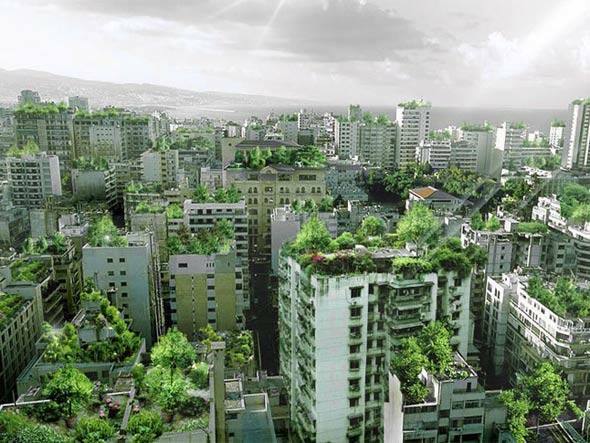 The project, Wonder Beirut Forest, covers the top of every building with plants and trees, giving new life to a city whose local greenery have been destroyed due to a tumultuous history of bombings. Architects began to campaign on Facebook with the possibility of approving a law that would provide for the installation of a garden on the roof of each building. As an incentive, the city would offer tax breaks for the condominiums to care for a roof garden, and gardening companies would offer discounts for maintenance. 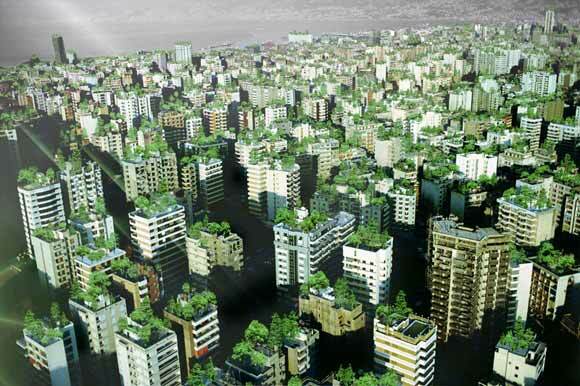 Beirut’s high levels of air pollution and ash inspired the project. Currently, the Lebanese capital relies only on a large wooded area—Sanayeh Park—for clean air. Today, Beirut only has 0.8 square meters of green space per person, well below the internationally recommended 12 square meters per person. “If only one tree is planted on each building, there would be 18,500 more trees in the city. That would be the equivalent of Central Park in New York,” said Wassim Melki of StudioInvisible. In addition to improving air quality, the large roof garden proposed by the architectural firm would provide shade and safe public community spaces. The gardens would also reduce energy consumption in buildings during the increasingly hot and arid summer climate. In addition, green roofs can shelter plants that grow well in the region, such as olives, pepper plants and vegetables that tend to evolve into a kind of urban agriculture, and thus would add to the local economy. 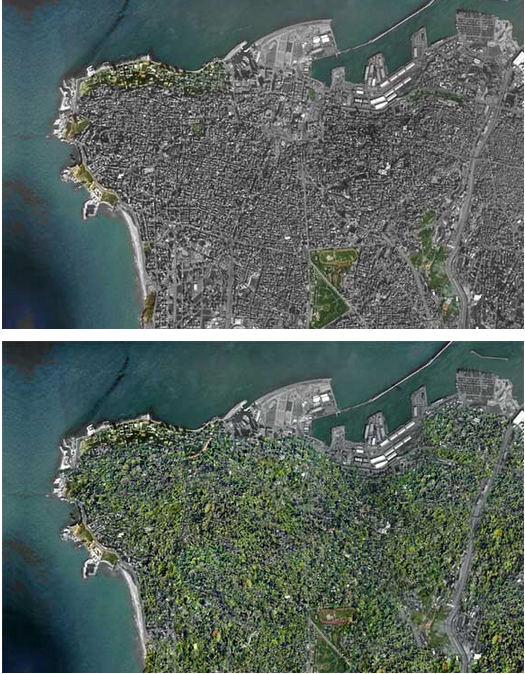 A bird's-eye view image of Beirut visualizes the city before and after the project's implementation. Photo via StudioInvisible.